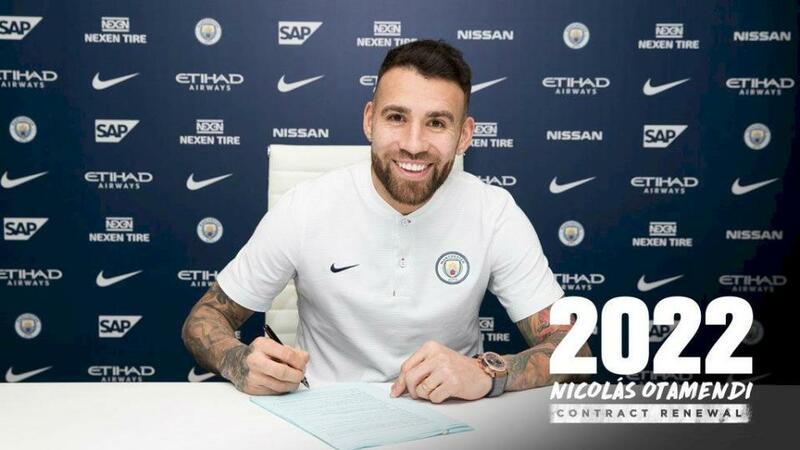 Nicolás Otamendi’s outstanding form this season has seen the Argentina defender sign a new deal with Manchester City that extends the 29-year-old’s current contract until 2020. One year ago, a summer overhaul was to be needed and no one more so than Nicolás Otamendi was deemed to be incompatible with Pep Guardiola’s system but the former Vélez defender has played in 22 of City’s 23 league games as they sit 12 points clear at the top. Otamendi, has made 118 appearances in all competitions for City since joining from Valencia for £33 million in the summer of 2015 and while that price tag was made to look very steep in his first two seasons, the defender dubbed ‘The General’ has become the cornerstone of City’s back four. “I’ve enjoyed my time at City since the first day I arrived and I’m really happy to have extended my stay here by a couple more years. My only aim is to help the team and give all I can for this Club. I am learning every day under Pep and enjoying my football and I feel I can still improve as a player,” Otamendi told the club’s official site. Kevin de Bruyne, David Silva, Sergio Agüero and many others deserve enormous praise for their roles in what many in the English media are building up to be one of the great Premier League sides but the rise of Nicolás Otamendi from over-priced, hot-headed, reckless liability to commanding defensive leader has been critical to Pep’s project. Aside from his timely defensive interventions and important goal threat, Guardiola has helped develop Otamendi into a far better ball-playing defender than imagined and in the Premier League, no player has completed more passes than the centre-back. If Guardiola had been willing to ship out Otamendi after his first season in charge, as some suggested, the City coach has been well and truly won over this term. “He is one of the players with the strongest mentality that I’ve met in my life. “A guy who wants to learn – in terms of ball possession. He was always strong in the air, winning duels is necessary in England. He has courage to play. If he loses a game, he says: ‘give me the ball again and play.’ I give a lot of credit and value to this kind of thing. “He has a lot of experience and he is such an important guy for us,” Guardiola said glowingly earlier in the season. A year and a half under the tutelage of Guardiola and the growth is clear. As the former Barcelona and Bayern Munich coach points out, Otamendi has always been strong in the air but his understanding of the role has improved, meaning the 29-year-old is caught out of possession far less, his attacking of the second ball has improved, leading to that increased number of goals and most impressively of all his passing is crisp and efficient. The contract extension is just reward for Otamendi’s form and City and Argentina will be hoping to further benefit from this over the course of 2018.